Bacterial meningitis must be the first and foremost consideration in the differential diagnosis of patients with headache, neck stiffness, fever, and altered mental status. Acute bacterial meningitis is a medical emergency, and delays in instituting effective antimicrobial therapy result in increased morbidity and mortality. In general, whenever the diagnosis of meningitis is strongly considered, a lumbar puncture should be promptly performed. Examination of the cerebrospinal fluid (CSF) is the cornerstone of the diagnosis. The diagnosis of bacterial meningitis is made by culture of the CSF sample. The opening pressure should be measured and the fluid sent for cell count (and differential count), chemistry (ie, CSF glucose and protein), and microbiology (ie, Gram stain and cultures). A concern regarding LP is that the lowering of CSF pressure from withdrawal of CSF could precipitate herniation of the brain. 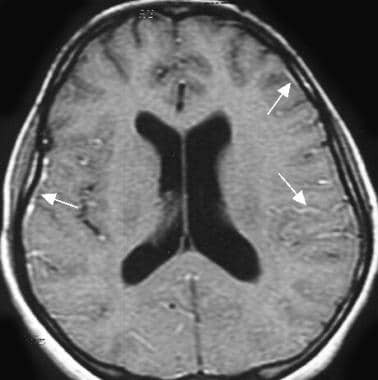 Herniation can sometimes occur in acute bacterial meningitis and other CNS infections as the consequence of severe cerebral edema or acute hydrocephalus. Clinically, this is manifested by an altered state of consciousness, abnormalities in pupil reflexes, and decerebrate or decorticate posturing. The incidence of herniation after LP, even in patients with papilledema, is approximately 1%. The decision to obtain a brain CT scan before LP should not delay the institution of antibiotic therapy; such delay can increase mortality. It should be also noted that herniation can occur in patients with bacterial meningitis who have a normal brain CT scan. The most reliable clinical signs that indicate the risk of herniation include deteriorating level of consciousness, brainstem signs, and a very recent seizure. Other laboratory tests, which may include blood cultures, are needed to complement the CSF culture. These bacterial cultures are used for identification of the offending bacteria and occasionally its serogroup, as well as for determination of the organism’s susceptibility to antibiotics. Special studies, such as serology and nucleic acid amplification, may also be performed, depending on clinical suspicion of an offending organism. The serum glucose level may be low if glycogen stores are depleted, or they may be high in infected patients with diabetes. A coagulation profile and platelet count are indicated in cases of chronic alcohol use, chronic liver disease, or suspected disseminated intravascular coagulation (DIC). Patients with coagulopathies may require platelets or fresh frozen plasma (FFP) before LP. The use of nucleic acid amplification (eg, polymerase chain reaction [PCR] testing) has revolutionized the diagnosis of herpes simplex virus (HSV) meningitis. The availability of this technique has confirmed HSV as the cause of the recurrent Mollaret meningitis. This technique has also been applied to the diagnosis of enteroviral infections and the other herpesvirus infections. The PCR assay for enteroviruses has been demonstrated to be substantially more sensitive than culture and is 94-100% specific. In patients with syphilis, initial results on nontreponemal tests can serve as a baseline for gauging the success of therapy. Titers decrease and usually revert to negative or undetectable levels following effective treatment. Elevated opening pressure correlates with increased risk of morbidity and mortality in bacterial and fungal meningitis. In bacterial meningitis, elevated opening pressure (reference range, 80-200 mm H2 O) suggests increased intracranial pressure (ICP) from cerebral edema. In viral meningitis, the opening pressure is usually within the reference range. The CSF opening pressure may be elevated at times in cryptococcal meningitis, suggesting increased ICP, and it is usually elevated in tuberculous meningitis. LCM = lymphocytic choriomeningitis; PCR = polymerase chain reaction; PMN = polymorphonuclear leukocyte; WBC = white blood cell. AFB = acid-fast bacillus; CSF = cerebrospinal fluid; HSV = herpes simplex virus; RBC = red blood cell; PMN = polymorphonuclear leukocyte. *Some bacteria (eg, Mycoplasma, Listeria, Leptospira spp, Borrelia burgdorferi [Lyme], and spirochetes) produce spinal fluid alterations that resemble the viral profile. An aseptic profile also is typical of partially treated bacterial infections (>33% of patients have received antimicrobial treatment, especially children) and the 2 most common causes of encephalitis—the potentially curable HSV and arboviruses. **In contrast, tuberculous meningitis and parasites resemble the fungal profile more closely. Tumor necrosis factor alpha (TNF-α), interleukin (IL)-1, and other cytokines have received increasing attention as mediators of the inflammatory response during bacterial meningitis. Leist et al reported detecting TNF-α in the CSF of 3 of 3 patients with bacterial meningitis, but in 0 of 7 patients with viral meningitis. Lopez-Cortez et al demonstrated that a TNF-α level higher than 150 pg/mL and an IL-1β level higher than 90 pg/mL showed sensitivities of 74% and 90%, respectively, in discriminating viral from aseptic meningitis. These findings, though requiring both confirmation and amplification, suggest that analysis of TNF and other cytokines, in particular IL-1β, may prove valuable in differentiating acute bacterial meningitis from viral meningitis and possibly in detecting patients at particular risk for an adverse outcome. Their role in guiding adjunctive therapy, such as corticosteroids and nonsteroidal treatment of blood-brain barrier injury, is also under investigation. Examination of the CSF in patients with acute bacterial meningitis reveals the characteristic neutrophilic pleocytosis (cell count usually ranging from hundreds to a few thousand, with >80% PMNs). In some (25-30%) cases of L monocytogenes meningitis, a lymphocytic predominance may occur. A low CSF white blood cell (WBC) count (< 20/µL) in the presence of a high bacterial load suggests a poor prognosis. In viral meningitis, the opening pressure is 90-200 mm H2 O, and the WBC count is 10-300/µL. Although the glucose concentration is typically normal, it can be below normal in meningitis from lymphocytic choriomeningitis virus (LCM), herpes simplex virus (HSV), mumps virus, and poliovirus. The protein concentration tends to be slightly elevated, but it can be within the reference range. The diagnosis of cryptococcal meningitis relies on the identification of the pathogen in the CSF. The CSF is characterized by a lymphocytic pleocytosis (10-200/µL), a reduced glucose level, and an elevated protein level. The CSF picture of other fungal meningitides is similar to that of cryptococcal meningitis, usually with lymphocytic pleocytosis. Eosinophilic pleocytosis has rarely been associated with C immitis meningitis. The definitive diagnosis usually relies on the demonstration of the specific fungal agent (eg, H capsulatum, C immitis, B dermatitidis, or Candida species) from clinical specimens, including the CSF. This could be in the form of fungal culture isolation (eg, C albicans growth from CSF). More commonly, fungal serology (eg, presence of histoplasma antigen in the CSF) is used in the diagnosis of many cases of fungal meningitis because isolating these organisms from culture has proved difficult. It should be noted, however, that the serology for B dermatitidis is not accurate and a negative serology finding does not rule out the diagnosis. Primary amebic meningoencephalitis (PAM) caused by N fowleri is characterized by a neutrophilic pleocytosis, low glucose levels, elevated protein levels, and red blood cells (RBCs). Mononuclear pleocytosis may be observed in patients with subacute or chronic forms of PAM. Demonstration of the trophozoites, with the characteristic ameboid movement, on wet preparations of the CSF has been used for diagnosis. Alternatively, the ameba may be demonstrated in biopsy specimens. In the presence of exposure, profound peripheral blood eosinophilia, and characteristic eosinophilic pleocytosis, suspicion of meningitis caused by A cantonensis, G spinigerum, or B procyonis should be entertained. Demonstrating the larvae ante mortem is usually difficult, and diagnosis relies on clinical presentation and a compatible epidemiologic history. Serologic tests may aid in the diagnosis. G spinigerum meningitis may mimic cerebrovascular disease in that it may cause cerebral hemorrhage. In patients with Lyme meningitis, the CSF is characterized by low-grade lymphocytic pleocytosis, low glucose levels, and elevated protein levels. Oligoclonal bands reactive to B burgdorferi antigens may be present. Demonstration of the specific antibody to B burgdorferi aids in the diagnosis. Comparison between the antibody response in the CSF and that in the serum is a helpful diagnostic test. A CSF-to-serum ratio greater than 1 suggests intrathecal antibody production and neuroborreliosis. In bacterial meningitis, the CSF glucose level (reference range, 40-70 mg/dL) is less than 40 mg/dL in 60% of patients. A simultaneous blood glucose determination should be obtained for the purposes of comparison. In patients with elevated blood glucose levels as a result of diabetes mellitus, the CSF-to-blood glucose ratio may not be predictive. The CSF glucose level is usually within the reference range in viral meningitis, but it may be low in some cases of LCM, HSV, mumps virus, or poliovirus infection. The CSF protein level (reference range, 20-50 mg/dL) is usually elevated in bacterial meningitis. In viral meningitis, these levels are also usually elevated, though they can be within the reference range. In syphilitic meningitis, abnormal CSF protein levels (elevated) and CSF glucose levels (decreased) may be observed in 10-70% of cases. Gram staining of the CSF permits rapid identification of the bacterial cause in 60-90% of patients with bacterial meningitis. The presence of bacteria is 100% specific, but the sensitivity of this test for detection is variable. The likelihood of detection is higher in the presence of a higher bacterial concentration and diminishes with prior antibiotic use. The demonstration of AFB (eg, with auramine-rhodamine stain, Ziehl-Neelsen stain, or Kinyoun stain) in the CSF is difficult and usually requires a large volume of CSF. Meningeal biopsy, with the demonstration of caseating granulomas and AFB on the smear, offers a higher yield than the CSF AFB smear. CSF bacterial cultures yield the bacterial cause in 70-85% of cases. The yield diminishes by 20% in patients who have received antimicrobial therapy. In these cases, some experts advocate the use of a CSF bacterial antigen assay. This is a latex agglutination technique that can detect the antigens of H influenzae type B (Hib), S pneumoniae, N meningitidis, E coli K1, and S agalactiae (group B streptococcus [GBS]). Its theoretical advantage is the detection of the bacterial antigens even after microbial killing, as is observed after antibacterial therapy. Others studies, however, have shown that the CSF bacterial antigen assay may not be better than the Gram stain. Although it is specific (a positive result indicates a diagnosis of bacterial meningitis), a negative finding on the bacterial antigen test does not rule out meningitis (50-95% sensitivity). C neoformans may be cultured from the CSF in cryptococcal meningitis. Other methods of identification include India ink preparation and the detection of CSF cryptococcal antigen. India ink has a sensitivity of only 50%, but it is highly diagnostic if positive. Because of the low sensitivity of the India ink preparation, many centers have adapted the use of CSF cryptococcal antigen determination, a test with a sensitivity exceeding 90%. However, the CSF cryptococcal antigen determination is not universally available. In instances when the India ink results are negative but the degree of clinical suspicion for cryptococcal meningitis is high, the CSF specimen may be sent to reference laboratories that can perform CSF cryptococcal antigen determination to confirm the diagnosis. In addition, the titer of the antigen could serve to monitor the response to treatment. Blood cultures and serum cryptococcal antigen should be obtained to determine whether cryptococcal fungemia is present. In syphilitic meningitis, isolating T pallidum from the CSF is extremely difficult and time-consuming. The spirochete could be demonstrated by using dark-field or phase-contrast microscopy on specimens collected from skin lesions (eg, chancres and other syphilitic lesions). The diagnosis is usually supported by the CSF VDRL test, which has a sensitivity of 30-70% (a negative result on the CSF VDRL test does not rule out syphilitic meningitis) and a high specificity (a positive test result suggests the disease). Care must always be taken not to contaminate the CSF with blood during spinal fluid collection (eg, traumatic tap). CSF culture for B burgdorferi has a low yield. The CSF Lyme PCR assay, if available, offers a rapid, sensitive, and specific method of diagnosis. This assay is gaining popularity as the method of choice for diagnosing Lyme meningitis. Culture for Mycobacterium usually takes several weeks and may delay definitive diagnosis. M tuberculosis detection assays involving nucleic acid amplification have become available and have the advantages of rapidity, high sensitivity, and high specificity. There remains a need for mycobacterial growth in cultures because this method offers the advantage of performing drug susceptibility assays. Isolation of viruses from the CSF has a sensitivity of 65-70% for enteroviruses. Alternatively, isolation of enteroviruses from throat and stool viral cultures may also indirectly implicate enterovirus as the cause of the meningitis. Culture of mumps virus from the CSF has a low sensitivity (30-50%). LCM virus may be cultured in blood early in the disease or in urine at a later stage. Computed tomography (CT) of the head and magnetic resonance imaging (MRI) of the brain generally do not aid in the diagnosis of meningitis. Some patients may show meningeal enhancement, but its absence does not rule out the condition. Routinely obtaining CT scans of the head may lead to unnecessary delay in the performance of diagnostic lumbar puncture and the initiation of antibiotic therapy; the latter may be detrimental to the outcome in these patients. Cerebral herniation following the lumbar tap procedure is rare in individuals with no focal neurologic deficits and no evidence of increased ICP. If it occurs, it usually does so within 24 hours after the LP; thus, herniation should always be considered in the differential diagnosis if the patient’s neurologic status deteriorates during that time frame. Acute bacterial meningitis. This axial nonenhanced computed tomography scan shows mild ventriculomegaly and sulcal effacement. Acute bacterial meningitis. 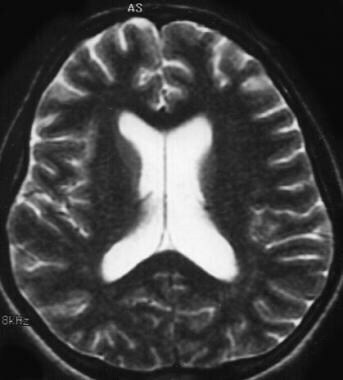 This axial T2-weighted magnetic resonance image shows only mild ventriculomegaly. Acute bacterial meningitis. This contrast-enhanced, axial T1-weighted magnetic resonance image shows leptomeningeal enhancement (arrows). Chronic mastoiditis and epidural empyema in a patient with bacterial meningitis. This axial computed tomography scan shows sclerosis of the temporal bone (chronic mastoiditis), an adjacent epidural empyema with marked dural enhancement (arrow), and the absence of left mastoid air. 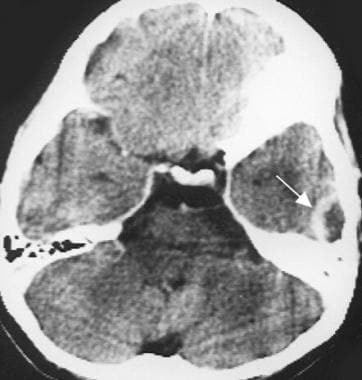 Subdural empyema and arterial infarct in a patient with bacterial meningitis. This contrast-enhanced axial computed tomography scan shows left-sided parenchymal hypoattenuation in the middle cerebral artery territory, with marked herniation and a prominent subdural empyema. Mann K, Jackson MA. Meningitis. Pediatr Rev. 2008 Dec. 29(12):417-29; quiz 430. [Medline]. Ginsberg L, Kidd D. Chronic and recurrent meningitis. Pract Neurol. 2008 Dec. 8(6):348-61. [Medline]. Berkhout B. Infectious diseases of the nervous system: pathogenesis and worldwide impact. IDrugs. 2008 Nov. 11(11):791-5. [Medline]. Koedel U, Klein M, Pfister HW. New understandings on the pathophysiology of bacterial meningitis. Curr Opin Infect Dis. 2010 Jun. 23(3):217-23. [Medline]. Thigpen MC, Whitney CG, Messonnier NE, Zell ER, Lynfield R, Hadler JL, et al. Bacterial meningitis in the United States, 1998-2007. N Engl J Med. 2011 May 26. 364(21):2016-25. [Medline]. Jaijakul S, Arias CA, Hossain M, Arduino RC, Wootton SH, Hasbun R. Toscana meningoencephalitis: a comparison to other viral central nervous system infections. J Clin Virol. 2012 Nov. 55(3):204-8. [Medline]. [Full Text]. West Nile Virus. Centers for Disease Control and Prevention. Available at http://www.cdc.gov/ncidod/dvbid/westnile/index.htm. Accessed: March 29, 2013. La Crosse encephalitis. Centers for Disease Control and Prevention. Available at http://www.cdc.gov/lac/. Accessed: March 29, 2013. Schut ES, Brouwer MC, Scarborough M, Mai NT, Thwaites GE, Farrar JJ, et al. Validation of a Dutch risk score predicting poor outcome in adults with bacterial meningitis in Vietnam and Malawi. PLoS One. 2012. 7(3):e34311. [Medline]. [Full Text]. Worsøe L, Cayé-Thomasen P, Brandt CT, Thomsen J, Østergaard C. Factors associated with the occurrence of hearing loss after pneumococcal meningitis. Clin Infect Dis. 2010 Oct 15. 51(8):917-24. [Medline]. van de Beek D, de Gans J, Spanjaard L, Weisfelt M, Reitsma JB, Vermeulen M. Clinical features and prognostic factors in adults with bacterial meningitis. N Engl J Med. 2004 Oct 28. 351(18):1849-59. [Medline]. Thomas KE, Hasbun R, Jekel J, Quagliarello VJ. The diagnostic accuracy of Kernig's sign, Brudzinski's sign, and nuchal rigidity in adults with suspected meningitis. Clin Infect Dis. 2002 Jul 1. 35(1):46-52. [Medline]. Moses S. Meningitis: acute bacterial meningitis. Accessed February 8, 2011. Available at http://www.fpnotebook.com/neuro/ID/Mngts.htm. Ramirez-Avila L, Slome S, Schuster FL, Gavali S, Schantz PM, Sejvar J, et al. 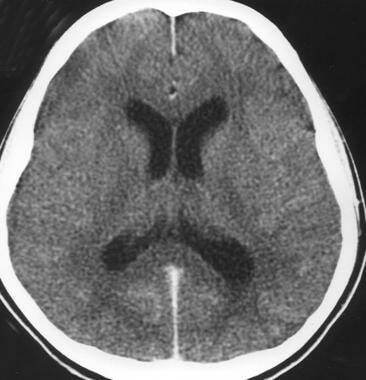 Eosinophilic meningitis due to Angiostrongylus and Gnathostoma species. Clin Infect Dis. 2009 Feb 1. 48(3):322-7. [Medline]. Hasbun R, Abrahams J, Jekel J, Quagliarello VJ. Computed tomography of the head before lumbar puncture in adults with suspected meningitis. N Engl J Med. 2001 Dec 13. 345(24):1727-33. [Medline]. [Guideline] Tunkel AR, Hartman BJ, Kaplan SL, Kaufman BA, Roos KL, Scheld WM, et al. Practice guidelines for the management of bacterial meningitis. Clin Infect Dis. 2004 Nov 1. 39(9):1267-84. [Medline]. Moïsi JC, Saha SK, Falade AG, Njanpop-Lafourcade BM, Oundo J, Zaidi AK, et al. Enhanced diagnosis of pneumococcal meningitis with use of the Binax NOW immunochromatographic test of Streptococcus pneumoniae antigen: a multisite study. Clin Infect Dis. 2009 Mar 1. 48 Suppl 2:S49-56. [Medline]. [Full Text]. Mustafa MM, Lebel MH, Ramilo O, Olsen KD, Reisch JS, Beutler B, et al. Correlation of interleukin-1 beta and cachectin concentrations in cerebrospinal fluid and outcome from bacterial meningitis. J Pediatr. 1989 Aug. 115(2):208-13. [Medline]. Seupaul RA. Evidence-based emergency medicine/rational clinical examination abstract. How do I perform a lumbar puncture and analyze the results to diagnose bacterial meningitis?. Ann Emerg Med. 2007 Jul. 50(1):85-7. [Medline]. Hughes S. Blood assay used for CSF detection in fungal meningitis. Medscape Medical News. Available at http://at http://www.medscape.com/viewarticle/781179. Accessed: April 3, 2013. Cohn KA, Thompson AD, Shah SS, Hines EM, Lyons TW, Welsh EJ, et al. Validation of a clinical prediction rule to distinguish Lyme meningitis from aseptic meningitis. Pediatrics. 2012 Jan. 129(1):e46-53. [Medline]. Gilbert DN, Moellering RC Jr, Sande MA. Antimicrobial Therapy. In: Sanford Guide to Antimicrobial Therapy. 33rd ed. March 15, 2003.
van de Beek D, Brouwer MC, Thwaites GE, Tunkel AR. Advances in treatment of bacterial meningitis. Lancet. 2012 Nov 10. 380(9854):1693-702. [Medline]. Mera RM, Miller LA, Amrine-Madsen H, Sahm DF. Impact of new Clinical Laboratory Standards Institute Streptococcus pneumoniae penicillin susceptibility testing breakpoints on reported resistance changes over time. Microb Drug Resist. 2011 Mar. 17(1):47-52. [Medline]. Gouveia EL, Reis JN, Flannery B, Cordeiro SM, Lima JB, Pinheiro RM, et al. Clinical outcome of pneumococcal meningitis during the emergence of pencillin-resistant Streptococcus pneumoniae: an observational study. BMC Infect Dis. 2011 Nov 21. 11:323. [Medline]. [Full Text]. Brouwer MC, Heckenberg SG, de Gans J, Spanjaard L, Reitsma JB, van de Beek D. Nationwide implementation of adjunctive dexamethasone therapy for pneumococcal meningitis. Neurology. 2010 Oct 26. 75(17):1533-9. [Medline]. van de Beek D, Farrar JJ, de Gans J, Mai NT, Molyneux EM, Peltola H, et al. Adjunctive dexamethasone in bacterial meningitis: a meta-analysis of individual patient data. Lancet Neurol. 2010 Mar. 9(3):254-63. [Medline]. [Full Text]. Peltola H, Roine I. Improving the outcomes in children with bacterial meningitis. Curr Opin Infect Dis. 2009 Jun. 22(3):250-5. [Medline]. van de Beek D, Drake JM, Tunkel AR. Nosocomial bacterial meningitis. N Engl J Med. 2010 Jan 14. 362(2):146-54. [Medline]. Sloan D, Dlamini S, Paul N, Dedicoat M. Treatment of acute cryptococcal meningitis in HIV infected adults, with an emphasis on resource-limited settings. Cochrane Database Syst Rev. 2008 Oct 8. CD005647. [Medline]. Kauffman CA, Bustamante B, Chapman SW, Pappas PG. Clinical practice guidelines for the management of sporotrichosis: 2007 update by the Infectious Diseases Society of America. Clin Infect Dis. 2007 Nov 15. 45(10):1255-65. [Medline]. Treatment of tuberculosis. MMWR Recomm Rep. 2003 Jun 20. 52:1-77. [Medline]. Report from the Advisory Committee on Immunization Practices (ACIP): decision not to recommend routine vaccination of all children aged 2-10 years with quadrivalent meningococcal conjugate vaccine (MCV4). MMWR Morb Mortal Wkly Rep. 2008 May 2. 57(17):462-5. [Medline]. FDA News Release: First vaccine approved by FDA to prevent serogroup B Meningococcal disease. Available at http://www.fda.gov/NewsEvents/Newsroom/PressAnnouncements/ucm420998.htm. Accessed: October 29, 2014. FDA News Release. FDA approves a second vaccine to prevent serogroup B meningococcal disease. Available at http://www.fda.gov/NewsEvents/Newsroom/PressAnnouncements/ucm431370.htm. Accessed: January 23, 2015. Nuorti JP, Whitney CG. Prevention of pneumococcal disease among infants and children - use of 13-valent pneumococcal conjugate vaccine and 23-valent pneumococcal polysaccharide vaccine - recommendations of the Advisory Committee on Immunization Practices (ACIP). MMWR Recomm Rep. 2010 Dec 10. 59:1-18. [Medline]. Kim SW, Jin JH, Kang SJ, Jung SI, Kim YS, Kim CK, et al. Therapeutic efficacy of meropenem for treatment of experimental penicillin-resistant pneumococcal meningitis. J Korean Med Sci. 2004 Feb. 19(1):21-6. [Medline]. [Full Text]. Abdelnour A, Silas PE, Lamas MR, Aragón CF, Chiu NC, Chiu CH, et al. Safety of a quadrivalent meningococcal serogroups A, C, W and Y conjugate vaccine (MenACWY-CRM) administered with routine infant vaccinations: Results of an open-label, randomized, phase 3b controlled study in healthy infants. Vaccine. 2014 Jan 4. [Medline]. Douglas D. Meningitis Vaccine Safe in Young Infants. Medscape [serial online]. Available at http://www.medscape.com/viewarticle/819521. Accessed: January 27, 2014. Jones SC, Morris J, Hill G, Alderman M, Ratard RC. St. Louis encephalitis outbreak in Louisiana in 2001. J La State Med Soc. 2002 Nov-Dec. 154(6):303-6. [Medline]. Nkoumou MO, Clevenbergh P, Betha G, Kombila M. Bacterial meningitis in HIV positive compared to HIV negative patients in an internal medicine ward of Librevile, Gabon. Int Conf AIDS: International Conference on AIDS. Jul 7-12 2002;abstract no. ThPeB7368. Scheld WM, Koedel U, Nathan B, Pfister HW. Pathophysiology of bacterial meningitis: mechanism(s) of neuronal injury. J Infect Dis. 2002 Dec 1. 186 Suppl 2:S225-33. [Medline]. van de Beek D, de Gans J, Tunkel AR, Wijdicks EF. Community-acquired bacterial meningitis in adults. N Engl J Med. 2006 Jan 5. 354(1):44-53. [Medline]. [Guideline] Tunkel AR, Hasbun R, Bhimraj A, Byers K, Kaplan SL, Michael Scheld W, et al. 2017 Infectious Diseases Society of America's Clinical Practice Guidelines for Healthcare-Associated Ventriculitis and Meningitis. Clin Infect Dis. 2017 Feb 14. [Medline]. 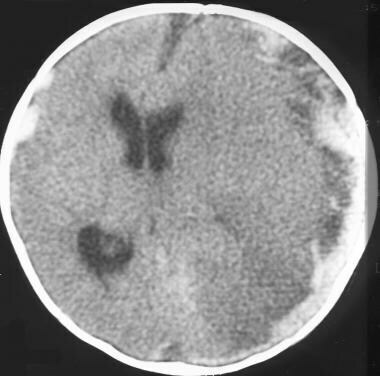 Pneumococcal meningitis in a patient with alcoholism. Courtesy of the CDC/Dr. Edwin P. Ewing, Jr.
HHV = human herpesvirus; HSV = herpes simplex virus; LCM = lymphocytic choriomeningitis. *Nosocomial meningitis is not included; these data include only the 5 major meningeal pathogens. CSF = cerebrospinal fluid; GBS = group B streptococcus. *Add ampicillin if Listeria monocytogenes is a suspected pathogen. MIC= minimal inhibitory concentration; TMP-SMX = trimethoprim-sulfamethoxazole. Disclosure: Received honoraria from Medicine''''''''s Company for speaking and teaching; Received honoraria from Cubicin for speaking and teaching; Received honoraria from Theravance for speaking and teaching; Received honoraria from Pfizer for speaking and teaching.